Moments before the attack on the satirical French newspaper Charlie Hebdo, the publication tweeted out a cartoon at 11:28 a.m. local time mocking the ISIS leader's New Year's message. The attack began minutes after the tweet from the newspaper's official account, when a car pulled up to the building that housed its office, French authorities said. The car, which Paris Prosecutor Francois Molins identified as a Citroen C3, contained at least two assailants who went on to kill 12 people and injure 11 others. As two assailants attacked the offices, one remained on the street, Paris Deputy Mayor Patrick Klugman told ABC News. The men were dressed in all black, wore hoods and had AK-47s, Molins said. They have not been identified and reportedly did not identify themselves as members of any specific terrorist or extremist group, authorities said. The killing began when they asked the doorman where the Charlie Hebdo office is located, and after the doorman answered, an assailant killed him, Molins said. There was also a police officer who had been ordered to guard the building because the newspaper had been the subject of threats in the past. The officer was killed and photos of the police vehicle riddled with bullets have been released. The attackers apparently entered the newspaper's offices when much of the staff was in the middle of an editorial meeting, authorities said. It was there that much of the violence occurred, and while no specific details from inside the office have been released, 10 people were killed there and 11 others were injured, Molins said. Corinne Rey, a cartoonist for the newspaper, told the Associated Press that the assailants forced her to open the door to the office using her security code. Rey, who works under the pen name "Coco," said she was arriving at the office with her daughter. She said that the shooting lasted five minutes and she survived by hiding under a desk. A spokeswoman from the Paris prosecutor's office earlier said that the paper's editor and cartoonist, Stephane Charbonnier, was among those killed. French Police officers gather outside the French satirical newspaper Charlie Hebdo's office, in Paris, Jan. 7, 2015. Witnesses from nearby buildings began shooting video of the scene after hearing the first gunshots, and on the audio from the footage the assailants can be heard shouting "Allahu akbar," an Islamic phrase that means "God is great." The gunmen returned to the street about five minutes after the attack began and fled in the Citroen, Molins said. The manhunt for the assailants is ongoing and the terror alert in Paris has been raised to the highest level. 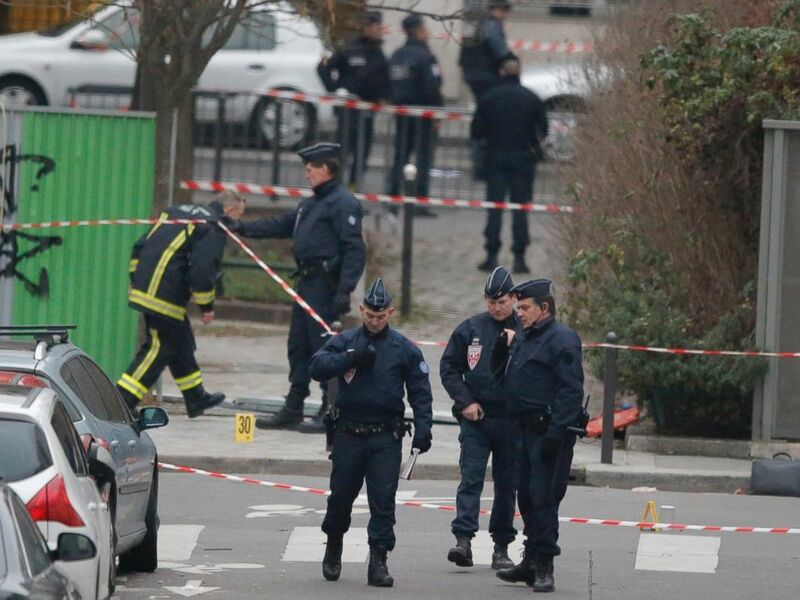 Police found the car that they believe was used by the assailants and removed it from a street in the Parisian neighborhood called Porte de Pantin. President Francois Hollande addressed the nation, saying that the search for the assailants was ongoing and announced that all flags in France would be ordered to half-staff. "They were marked by their independence," he said of the victims. Paris Deputy Mayor Patrick Klugman told ABC News that authorities have identified the three assailants, and knew their ages -- 34, 32 and 18 -- but they were not ready to reveal their names or confirm reports of arrests. The search for the suspects is ongoing. Who is running for president in 2020?